Property Details: 2 BR, 2 BA Resort Property, Sleeps 6. 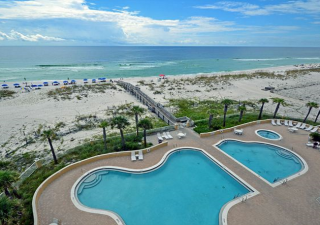 Pensacola Beach vacation rental at Emerald Isle condominium – amazing beachfront Florida resort property with incredible views of the white-sand beaches and emerald waters of the Gulf of Mexico. The community has two pools, (one heated) plus a large hot tub for relaxing in the evening. This Florida vacation rental home has a private balcony and a work-out room that overlooks the pools/beach. This Pensacola Beach condominium home is walking distance to numerous restaurants, shopping and outdoor activities. This gulf-front Emerald Isle residence will provide you with the amenities of home to ensure the best vacation possible. The kitchen is completely stocked with cookware, utensils, coffee maker, etc.. The condo is also equipped with a clothes washer & dryer, dish washer, refrigerator/ice maker….plan your Florida vacation today! Pensacola Beach Florida is a coastal community located on Santa Rosa Island, a barrier island on the Florida panhandle. It is situated south of Pensacola/Gulf Breeze on the popular beaches of the Gulf of Mexico. Pensacola Beach occupies land bound by a 1947 deed from the United States Department of Interior. There is an array of Pensacola Beach homes for sale & for rent to suit anyone and make your visit to Florida more enjoyable.